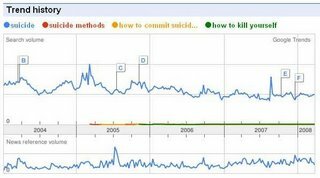 Webometric investigations rarely gain mainstream interest, yesterday, however, one did: A content analysis of the top 10 sites, on the four major search engines, for 12 searches relating to suicide. This highlighted the large number of hits that were to ‘dedicated suicide sites’ (e.g.. pro-suicide, encouraging, describing methods, or portraying suicide in fashionable terms): 90 out of 480 hits. Unsurprisingly this gained the interest of numerous news sites including the BBC. There are, however, a number of problems with the study: not all search terms are equal, and not all search engines are equal. Whilst we all make sweeping statements about web phenomena, we should really save it for our blogs rather than publication in the likes of the British Medical Journal (BMJ). The main problem of the investigation is a focus on the information that is retrievable rather than the information that is actually being retrieved, which quickly muddies the water. Whilst the combining of search engines would initially seem to underestimate the scale of the problem, the propensity of users to use certain search terms would seem to indicate that the article has overestimated the scale of the problem. However, almost 70% of searches use Google, which as the results show has the highest number of dedicated suicide sites in the results. 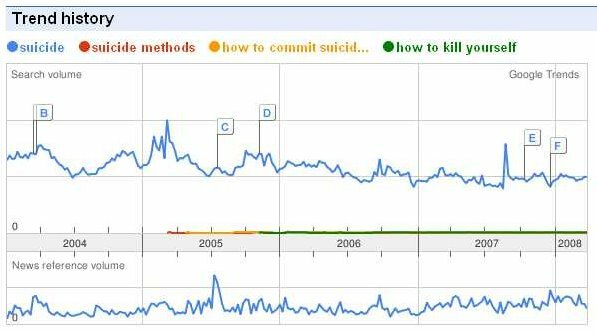 This would seem to underestimate the problem: whereas just under a fifth of the hits were dedicated suicide sites overall, for the most influential search engine this has risen to just under a quarter. However, when looking at the search terms used, we soon reaslise that the problem has been over-stated. Below are the top ten links I received when looking at the global results from google.co.uk for the term ‘suicide’, and how I would classify them. Whilst the BMJ study emphasises that is doesn’t restrict the results to the UK, it does not mention whether it uses google.com or google.co.uk. I have used google.co.uk as, unless you ask it otherwise, google.com will redirect British users to google.co.uk. Whilst classification is notoriously difficult to get agreement on, none of these sites could be considered the sort of ‘dedicated suicide sites’ that will spread panic through middle-England. I have no doubt that there are plenty of sites on the web that encourage suicide, but before we start a panic we need to have a greater understanding of how people are searching on the topic of suicide when they are feeling suicidal. We can’t just lump together the findings of different searches on different search engines and say that statistically we have a problem. The most popular search on the most popular search engine on the topic of suicide does not find any ‘dedicated suicide sites’. Biddle, L., Donovan, J., Hawton, K., Kapur, N., & Gunnell, D. (2008). Suicide and the internet. British Medical Journal, 336(12 April 2008), p. 800-802. China redirects: Could my ISP do the same? The big news in the blogosphere this afternoon seems to be Chinese surfers being redirected from the US search engines to Baidu, with many suggesting that it is a reaction to George Bush recognising the Dalai Lama. Whilst the blogosphere is unsurprisingly outraged, personally I quite like the idea of having my ISP stopping me going to Google. We all have certain URLs we type into the address bar automatically. If I am searching for something I find myself typing ‘google.com’ without a thought for Ask, MSN, Yahoo, or any of the thousand other search engines available. If I am momentarily at a loss as to what to do next I find myself returning to my emails for the umpteenth time, or checking my bloglines for the zillionth time. If my ISP forced me to use another search engine every now and again, or forced me to have reasonable periods of time elapse before returning to the same web site again and again, I am sure I would utilise the web much more productively. Yes, I know, civil liberties, blah blah blah…I’m just saying that there is an up side.